The Odessa funicular is situated beside the famous Potemkin Stairs and offers non-stair-loving individuals an alternative way to travel between the Primorsky Boulevard and the Port of Odessa. As far the price goes, it’s pretty hard to complain, a trip up or down the hill costs just UAH 3 (€0.09). Yep! That’s less than 10 cents a ride. 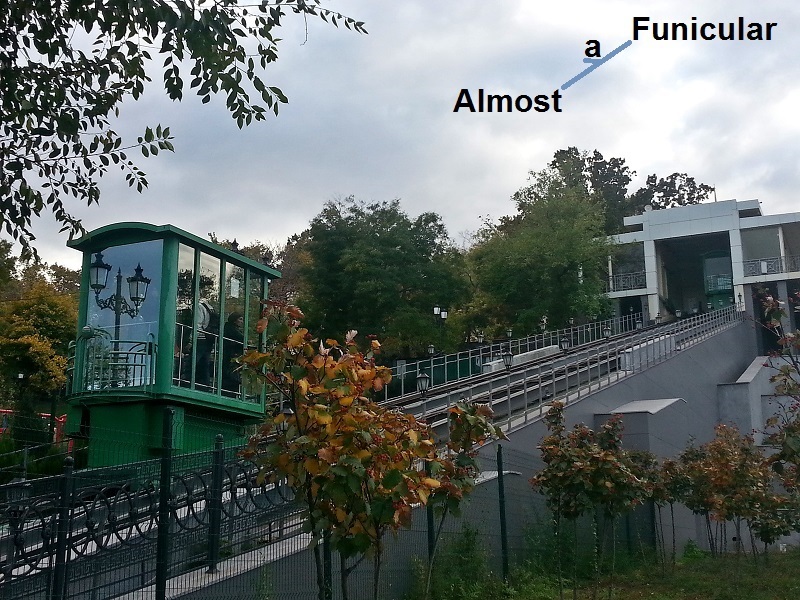 One of the most interesting things about the Odessa funicular is it’s not a funicular at all. Genuine funicular railways consist of two cabs that are joined by a long metal cable. As one travels up the hill the other goes down and each one counterbalances the weight of the other. Although this is how the railway used to work it is no longer the case. The two cabs are not joined and can be winched up and down the hill independent of each other. So the present day Odessa funicular is not a funicular railway at all. Like the Montmartre funicular in Paris, it’s actually a double inclined elevator and, if desired, the company that owns the funicular can run only one cab instead of two. The Odessa funicular was designed by the Soviet engineer N I Pyatnitsky. It first went into service on 8 June 1902 using a pair of passenger cabs made in Paris. At this point, it was a true funicular railway that consisted of one track and passing loop for the cabs. Each cab was capable of carrying 35 people. Dramatic changes were implemented in 1969 when the funicular was replaced by an enclosed escalator system. After the collapse of the USSR, the escalator fell into a state of disrepair and the escalator that originally carried people down to the Port of Odessa was taken out of commission and used as a source of spare parts for the escalator responsible for carrying people up the hill. In 1997, the escalator closed for good. In 1998, the city council decided to replace the escalator with inclined elevators and work began the same year. However, work had to be stopped due to changes in the local government. Fortunately, the project was revived in 2005 thanks to another change of power. The present system consists of two straight tracks running parallel with each other and, although the cabs were introduced after the turn of the century, they both have a dated look. The cabs are also considerably smaller than those used on the original Odessa Funicular. Each one can only carry 12 people instead of 35. The other big difference is the speed. The present-day funicular cabs move slower than their predecessors and the 130-meter journey takes around 3.5 minutes. Anyone who is in a hurry will most likely find it quicker to use the Potemkin Stairs. My health is excellent and I do not have any mobility issues, so there is no reason for me to avoid using stairs. However, I like funicular railways and every time I’m somewhere that has one I make a point of riding it, though I only ever do so once and always choose to take the funicular down the hill instead of up. In my experience, the views on the way down are always better than the ones you see going up. Odessa is no exception. The funicular cab offers a fantastic view of the Port of Odessa. Of course, the view is the same when you take the stairs, but I still really enjoyed my one and only Odessa funicular ride. Earlier this year, when I travelled on the funicular in the Portuguese city of Porto, I was not aware of any operators in the cab. Everything appeared to be controlled from elsewhere. The funicular at Prague has an onboard operator, situated in a separate driver’s booth at the front of the cab. The Odessa funicular is very different. The operator took my money at the door and operated the cab by using a set of controls at the front corner. She had a small chair with her so she could sit down if she needed to. For anyone who has mobility issues, the Odessa funicular is likely to be a godsend but, even for those who do not, taking a ride in one of the distinctive green cabs is likely to be an interesting experience. If you are in Odessa, you owe it to yourself to try it at least once and it’s likely to be the cheapest funicular ride you’ll ever have.